I had two older brothers, so the first three or four years of my life, as soon as I learned to walk, I used to just field in the backyard. They would occasionally let me have a bat and a bowl, but if I batted for too long they'd just give me a bad decision and say that I was out. So I guess that's where my fielding abilities came from. I should have played more Test cricket. But at the end of the day your destiny is in your own hands. If I'd played more consistently and better, I think I would have got the opportunity to play more Tests. Once, in the 1990s in Colombo, Sachin Tendulkar was playing us well on a flat wicket. He was dominating me, as he often did. Then I bowled a quicker one which slid down the leg side. He tried to turn it but got a leading edge. It came back and I just dived full stretch and took it in one hand. I actually won an award for it. I don't think any dressing room is that different to any [other]. They are very similar. Generally the chat is the same, it's talking about cricket. People are talking about how fast a guy bowled, how much it was spinning, how big the six was, and I think that's why cricket's such a great game, because no matter where it happens in the world, to me everything is very similar. I don't think I've batted better than the 1996 World Cup quarter-final against Australia. But there's times when I've batted under more pressure and helped win New Zealand a game. Batting in Madras in that horrendous heat and humidity was tough. It was one of the hardest things I've had to do, because then I ended up bowling ten overs on the trot as well. But unfortunately, it was to end up on being the losing side. The world's an oyster for the cricketer now. There are just so many options. In my day you obviously had to play international cricket. I'd like to believe that's still every cricketer's dream, but now there's just so many other options. I learned very early on in my career not to sledge too much. Purely because I found that when I sledged, it backfired. I remember doing it with Craig Spearman in a first-class game. I bowled a length ball that he left and then he practised the pull shot, and I remember saying to him, "Don't practise it, if you're good enough, play it." And then next ball he hit me out of the ground for six. I don't remember the exact phone call. I just remember them saying you're in the team to go to Australia [in 1990]. My brothers used to call me Bugs, because I had two very big front teeth. And they thought I looked a bit like Bugs Bunny. But one day I was at a swimming pool and I slipped over and chipped my front tooth. So I had only one big tooth, so they said we can't call you Bugs, so we'll call you Lugs, because your ears are quite big. My bowling action was accidental. If I had my time again, I think I would have tried to change it earlier. I was told at a very early age, in under-age teams, that as selectors you get put in a situation where there may be two people with very even batting and bowling skills and they are not sure which way to go. They always go back to who's the best fielder. I guess for us, being New Zealanders, the team we really wanted to do well against was Australia. Purely because they were our big neighbours, that was always the massive competition, not just in cricket but in all sports. It's something we've always treasured, our wins against Australia. 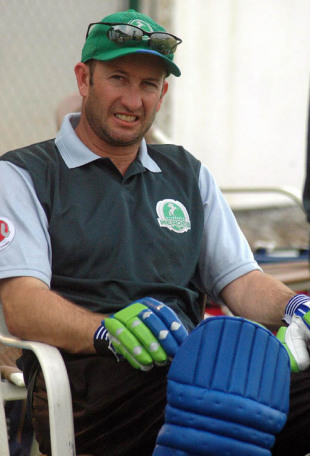 I would have loved to have played international T20 cricket. When it first came out I thought as a bowler, as a slow bowler, a spin bowler, you think you're probably going to get hurt quite badly. I think now T20 cricket has shown that the spinners have got a massive role to play. From that perspective, I would have had an all-round role. Martin Crowe was such a batting technician. Just always loved to watch him, especially playing fast bowling. I was fortunate enough to play with him a lot in my career. I don't think you can focus too much on your successes and failures or concentrate too much on them. Any cricketer is going to have more failures than successes. You're high one day and you're low the next. "I should have played more Test cricket. But at the end of the day your destiny is in your own hands. If I'd played more consistently and better, I think I would have got the opportunity to play more Tests"
Merv Hughes was quite abusive to me but he's a guy who is very friendly off the field and I got on very well with him. I remember playing a New Zealand President's game against Australia and he bowled me a couple of bouncers that I nicked over slips. He came down and said, "I don't want to get you out now, I just want to kill you." As any growing boy you want to follow in your father's footsteps, so I always wanted to play cricket for New Zealand. My 250th ODI was effectively the end of my international career, because I injured my shoulder and had to have three operations to put six pins to re-attach my tendon to my shoulders. It was a very emotional day. I guess in some ways I'm still dealing with it now, because at the time I thought I was always going to come back. I just thought it was a matter of patching my shoulder up - might be out for six months and then I'll be back. I guess coaching is a way of holding on to it a little bit. I actually turned 21 over in Australia in my debut series. In those days the Australian crowds were pretty big and menacing. I remember getting a lot of abuse. But I remember it fondly. It was a wonderful experience. I can remember three overseas trips - Sri Lanka twice and once in Pakistan - where bombs exploded in the vicinity of the team hotel. Those experiences showed me how vulnerable you can be. When your time's up, your time's up. There's nothing you can do about it. Even though I don't think we were directly targeted in any of those attacks, if you're in the wrong place at the wrong time, there's no discrimination in the blast zone. I think in some ways my bowling action gave me some of my success, because I bowled off the wrong foot. It meant I didn't have much body momentum and I didn't get a lot of pace on the ball. I guess people tended to play earlier than they should have. No matter how good a player you are, you spend more time fielding than anything else. I opened twice. In Wellington, India batted first and got quite a few runs. It had never been discussed before that I was opening, and then at lunchtime Ken Rutherford, who was captain at the time, came to me and said we want you to open the batting. It took me by surprise. I remember facing [Javagal] Srinath and there was a big lbw appeal early on. I remember charging down the wicket a few times and ended up getting 44. I got out caught at cover off [Anil] Kumble, but that innings gave me confidence. I then went to Christchurch and got out for a duck and never opened again. I like to think I'm a bit of a people person. I'd like to think I'm reasonably friendly, and I'm pretty happy to talk to anyone who wants to talk to me. I'd like to think that most players I played with and against, if I saw now, I'd cross the street and say hi and we'd have a coffee together, or a beer. If you're not bowling the only way you can be involved is obviously by fielding. I guess I took it upon myself to try and test myself all the time and say, "Look, if I'm in the circle, I'm going to make sure they don't get one to me. Or if I'm on the boundary I'm going to make sure they don't get two. Every chance that comes to me I'm going to try and grab no matter how far away it is." Because I enjoyed it, I try and encourage all cricketers to do it. I'd always tend to put my front pad on first, and if I'd batted through to lunch or tea, I'd always want the other batsman to cross the rope first. I'd mark my crease six times. And if I tapped my bat out in the middle, I'd have to do that six times as well. I've played in four World Cups and I think we've been pretty consistent. I guess the saddest thing is never to have won a World Cup. We had the best chance in 1992, just because we had the momentum. If we had knocked out Pakistan, going to Australia and playing in Melbourne, we'd have given ourselves a good chance of winning. The ICL was a wonderful concept and it was a shame it didn't continue. I loved it. It was a wonderful experience, being involved with a lot of local Indian players, young up-and-coming players, and some other international players from other teams. I guess at the end of the day the BCCI was trying to protect its own tournament. It was tough from New Zealand Cricket's point of view as well. They had to be seen to support the Indian board. I still live in Christchurch. I was in England at the time of the earthquake and my family was home. I got on the flight the next day and came home. It was horrendous. Everyone was extremely shaken up. I guess in some ways you feel pretty guilty, but it made it an easier decision to move out of Christchurch to start my coaching career [in Zimbabwe]. Although Christchurch has always been my home and a wonderful place to live. I think the best lesson I can pass on is to try and keep focused and ride a straight line as opposed to riding the wave. We just had a plan to go out and go hard all the time. I think it sort of clicked against Australia. We said we've got nothing to lose. We're going to take them on. I think after that it flowed and we said this is the way we're always going to play. Always feel as though we've got a chance, whatever it takes, never die wondering. I was very lucky. There are some people who got injured very early in their career. I felt very fortunate to have represented my country in 250 ODIs. Loved every moment of it. Are there things I'd change in my career? Not too much. It's always nice to play with your brother. I played a little bit with Ben for Canterbury. He also played for Otago. I was more nervous watching him than when I was playing. [Playing against him] was similar. You're still nervous for him. Obviously you want your team to win, but it's always nice to see your brother do well. I didn't mind the new ball, because in those days I was bowling a little bit of medium-pace inswingers, so the newer the ball, the more it swung. I think I was a much better bowler when the ball was swinging as well, because it gave me more variations. 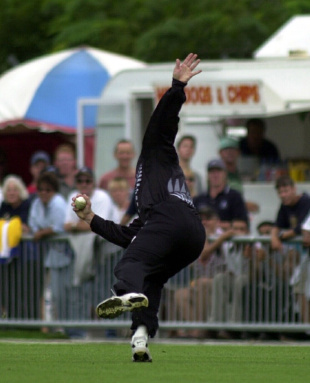 Winning the ICC Knockout in 2000 was one of the best triumphs of my career. The big difference for me from one-day cricket to Test cricket is that in one-day cricket I think I was a genuine allrounder, generally bowled my ten overs and batted in the middle order. In Test cricket I was seen more as a batsman who bowled a bit, so I put a lot more pressure on my batting, and I guess that weighed on me a little bit. That made it more difficult for me to have consistency and longevity in Test cricket.